We have a few hundred copies left of the previous (9th) edition, published in 2010. We would be happy to donate these free of charge for educational purposes in Edinburgh or the Lothians. For example it might be an interesting exercise for pupils/students to identify changes between the previous and current editions [e.g. how many bike shops or what length of cycleroute were there in 2010 and 2016?] – or they could be used for outdoor activities and learning map-reading. 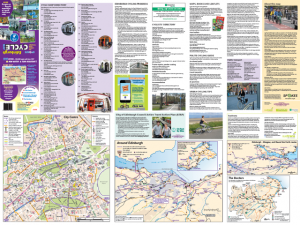 We also have some unfolded laminated copies of the 2010 map, available free for the same purposes. If your school or education centre would like some of the free copies please contact Mies Knottenbelt [email mknottenbelt1 AT gmail.com] to say how many you would like and (very briefly) how you would use them. Feel free to apply for any number you would find useful, as we don’t want leftovers! We will restrict numbers if necessary. But please only reply if you can use at least 5 maps, preferably more. If you just want one or two maps, we suggest you buy the current edition!! This offer is only open to educational bodies – not cycling groups etc! – but any group can buy the 2016 edition at reduced bulk prices if you order 6 or more copies – see below. 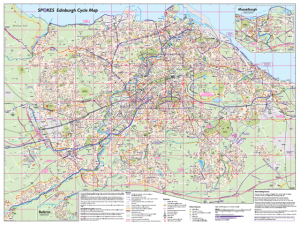 If at the same time you wish to order one or more copies of the new Edinburgh map, we can deliver these along with the free old edition maps [note the reduced bulk price if you order 6 or more copies of the new map for your school or college]. In addition to the normal folded copies, we have a limited supply of the new maps unfolded, for wall display. These are available at the same price, maximum one copy per organisation – or, if you are buying at least 6 maps, one free copy [until they run out].